If you benefit from this work, become a supporter today. Keeping K-12 Cyber Secure (#k12cybersecure) is the free, semimonthly email newsletter of the K-12 Cybersecurity Resource Center. 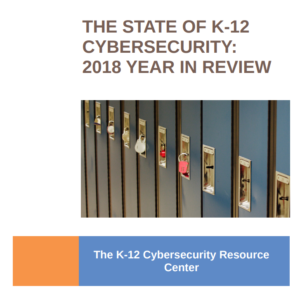 Each edition highlights new updates to the K-12 Cyber Incident Map, recent updates to the Resource Center, and other news and commentary from the cybersecurity field with relevance to U.S. K-12 schools and districts. Delivered direct to your inbox, it is the easiest way to ensure you keep up-to-date with the K-12-specific cybersecurity news you need. IMPORTANT: We use a double-opt in process to confirm your subscription. You must respond to a confirmation email before you are added to our mailing list. Please whitelist our email address <info [at] edtechstrategies dot com> to ensure delivery of the newsletter to your inbox.